Chasing the Moon thoroughly reimagines the race to the moon, upending much of the conventional mythology. 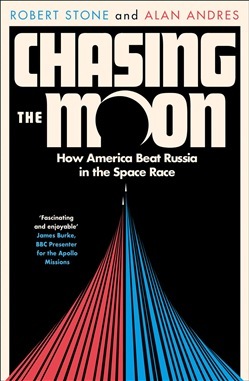 With newly revealed stories about the space race, from its earliest days to the monumental achievement of the lunar landing in 1969, the book features a diverse cast of characters who played key roles in these historic events. Utilising a wealth of previously overlooked and lost archival material, much of which has never before been revealed to the public, the Space Age is recast as a fascinating stew of scientific innovation, political calculation, media spectacle, visionary impulses and personal drama in this fascinating new book. Among those included are astronauts Buzz Aldrin, Frank Borman and Bill Anders; Sergei Khrushchev, son of the former Soviet premier and a leading Soviet rocket engineer; Poppy Northcutt, a 25-year old ‘mathematics whiz’ who gained worldwide attention as the first woman to serve in the all-male bastion of NASA’s Mission Control; and Ed Dwight, the Air Force pilot selected by the Kennedy administration to train as America’s first black astronaut. Acquista Chasing the Moon: The Story of the Space Race - from Arthur C. Clarke to the Apollo landings in Epub: dopo aver letto l’ebook Chasing the Moon: The Story of the Space Race - from Arthur C. Clarke to the Apollo landings di Robert Stone, Alan Andres ti invitiamo a lasciarci una Recensione qui sotto: sarà utile agli utenti che non abbiano ancora letto questo libro e che vogliano avere delle opinioni altrui. L’opinione su di un libro è molto soggettiva e per questo leggere eventuali recensioni negative non ci dovrà frenare dall’acquisto, anzi dovrà spingerci ad acquistare il libro in fretta per poter dire la nostra ed eventualmente smentire quanto commentato da altri, contribuendo ad arricchire più possibile i commenti e dare sempre più spunti di confronto al pubblico online.